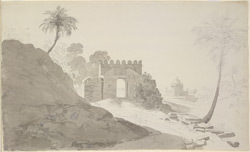 Pencil and wash drawing of the Western gate of Sher Shah's Tomb at Sasaram (Bihar), by Thomas Daniell, dated February 1790. Inscribed on back in ink: 'Westn Gate leads to Shere Shah's Tomb Sasseram'; in pencil: 'No' 92. The magnificent mausoleum of the emperor Sher Shah Sur (reigned 1540-45) is a domed, three-storeyed, octagonal building which stands on a stepped square plinth at the centre of a lake. This drawing depicts the gateway that leads to the tomb through a causeway placed across the large lake. Sher Shah sat on the Mughal throne in Delhi for five years during which he achieved substantial reforms of the empire's administration and constructed many buildings and roads.